Ever wanted to touch art? Let’s eat it. At Bluespoon. Dozens of images per second translate into a video art-inspired menu, as the largest video art collection in the Netherlands, The Mind’s Eye, inspires a chef and restaurant for its latest masterpiece. Following a tour of Andaz Amsterdam Prinsengracht’s eclectic video art collection, the selections were made and the first edible exhibition from Bluespoon was curated. The result? A 4-course menu mirroring five pieces of video art carefully chosen by Chef Sander Bierenbroodspot and painted with a lot more colours than Bluespoon blue. Take One. Action. You might share a city with 15 million people, but you are often alone. 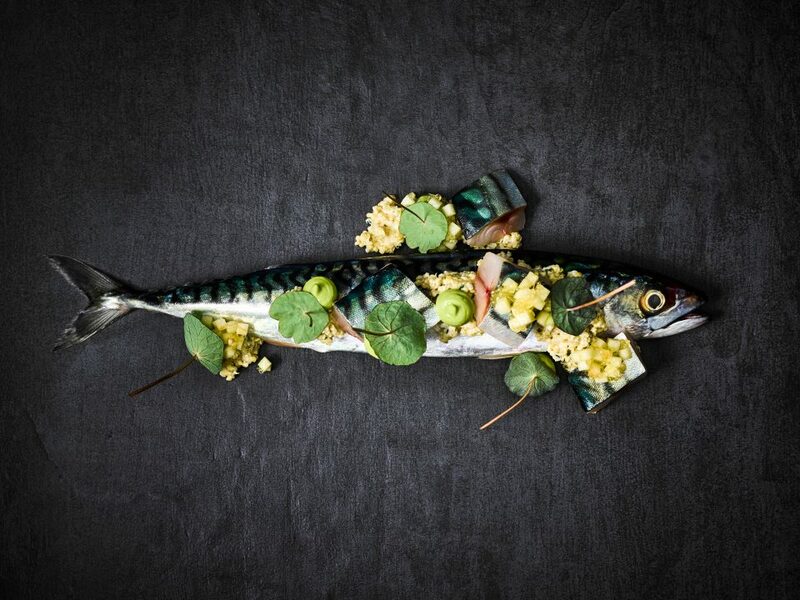 Just like the lonely lead in Meiro Koizumi’s My Voice Would Reach You, Sander chose the often-forgotten Mackerel as the main character in his starter, with the fresh flavours of avocado, finger lime, quinoa and apple as company. For an in-between, the simplicity of Rijpma’s Tape Generations, combines with the mesmerizing cloud formations of Forecast. Once a subtle sherry foam settles, succulent scallops peak through. As for the main event, the (not so) vegetarian main course, captures Mastering Bambi by Dutch artists Persijn Broersen & Margit Lukács, a thought-provoking play on the Disney classic. For an immersive ending, Mondrian’s iconic colours, lines and shapes connect chosen ingredients with particular flavour sensations, for a spoon-less dessert inspired by Cristina Lucas’ Abstraction Licking. The creative nature of Bluespoon and Sander’s art of plating is embedded in the history of the hotel. The aesthetic character of Andaz Amsterdam Prinsengracht, the iconic design by Marcel Wanders, and the hotel’s renowned video art collection which is the largest in the Netherlands with over 50 pieces, are all available for guests to watch. Not short of inspiration, Bluespoon takes this a step further and invites you to eat art, sniff it, touch it, lick it…you might not have a choice, to fully experience (the art of) Bluespoon. To celebrate mackerel winning back its sustainable status and to support sustainable fishing, Bluespoon have partnered with the Good Fish Foundation. Bluespoon is donating 1 EURO from every sold mackerel dish to the foundation. Our very own Executive Chef Sander has officially been named the Horeca ambassador for the Good Fish Foundation.